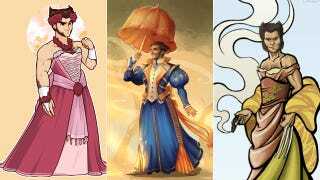 While we've seen lots of remixes of Disney princesses—princesses dressed as the Doctors, as Sith Lords, as their princes, and more—but David J Prokopetz is flipping that artistic script, collecting drawings of Wolverine in gowns worthy of a singing princess. Prokopetz has collected 14 of these dressed-up Wolverine images so far in his quest to prove that Wolverine is Disney's best princess (since Marvel is now owned by Disney). He is paying artists $50 a pop to draw wolverine in all of his hairy glory as a beautiful princess. You can see them all on his Tumblr.